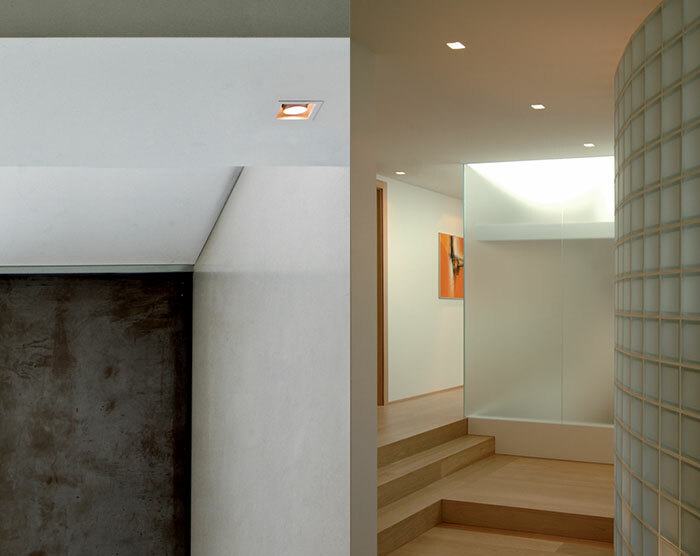 IP20-rated recessed light fitting for indoor use in white or grey painted metal. it can be installed in plasterboard or mounted on brickwork ceilings using a special housing. dimensions profile: three versions available: one adjustable 50W version (with GU10 and GU5,3 sockets) or 35W (with GX10 socket), one 45° 35W (with GU4 socket), 40W (with G9 socket), with 3W 3000K white led, and one 90° 50W (with GU5,3 or GY6,35 sockets), 40W (with G9 socket), with 9W 3000K white led. the 45° and 90° versions are wired with a 12V dichroic lamp, 240V halogen lamp or with leds, power supply unit included. the adjustable version is wired with 240V halogen lamps, 12V dichroic lamps or 240V metal halide lamps. the light fitting can have a frosted glass diffuser. a 17W-1600lm 3000K led version is also available with symmetric and asymmetric 60° optic . power supply unit not supplied, available in the finishes my nero and my bianco. are available for the latter version the frosted glass diffuser. All versions can be used as step lights or as ambient lighting.